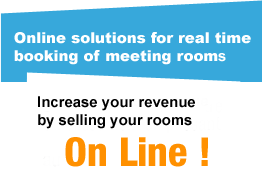 MRC - Online meeting room booking solution, Grow your venue's revenue by going online! Online booking is no longer just for the airline and hotel industries. Today, businesses want to book meetings online in under five minutes with just a few clicks. With MyMRC©, your website becomes a sales channel for your meeting rooms, allowing companies book them for seminars or workshops. Seizing opportunities to offer innovative services is vital. Online booking is a real "plus" for your customers, giving you a genuine point of difference. Spread the word! Boost your sales using the promotion management module integrated into the MyMRC© solution. MyMRC© lets you speak directly to your customers and prospects. Your venue is shown together with a description and the real time availability of your rooms. Assign one or more meeting rooms to this new service and watch your bookings and revenue grow.